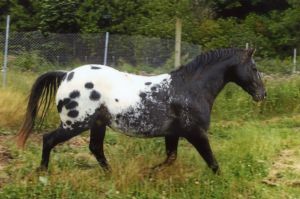 For over 53 years, Marlene Ross has bred the most beautiful black and white Foundation APPALOOSAS on her beautiful mountain ranch in Darrington, WA! Please take a moment and view Wakon's beautiful mares, stallions, fillies, colts, and weanlings. Wakon Appaloosas are available for sale! Wakon Appaloosas is one of the few places where you can find true supreme quality Foundation Appaloosas in beautiful black and white blanketed and black leopard patterns; with the typical intelligent loving disposition. Mares, foals, and stallions available! If you are interested in a Wakon Appaloosa please call Marlene at (360)-436-1904 in the early morning Pacific Coast Time (6:30AM to 11:00AM) or email wakon23@hotmail.com. Marlene always has weanlings, young stock, mares, and stallions available at all times. Don't miss out on the best Foundation Appaloosas from Wakon! Call today!